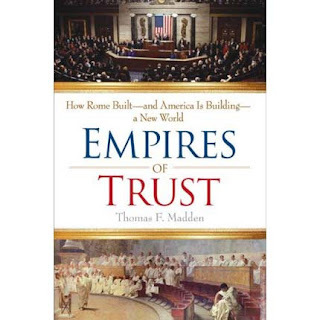 Thomas F. Madden's Empires of Trust argues for an exceptional quality which marks the Roman Empire and the "American Empire" as historical aberrations. Rather than functioning as "Empires of Conquest," expanding borders via force of arms, they build their empires primarily through alliances with neighboring states. These alliances are desirable to other states because of a hard-earned, time-tested "trust" in Roman/American responsible use of power. While towards this end he contends effectively, elsewhere I believe his project fails. Much of the success of these "Empires of Trust" Madden attributes to an unwillingness to expand---a general isolationist attitude which is deeply set in the national character. Romans and Americans, he writes, have inherited this mindset from their forebears, the pioneering frontier farmers. This in itself is a possible point of contention, I believe, but as Madden takes it further, it moves into the land of the fantastical. The idea that this pervasive isolationist natural character translates uniformly and directly into a state policy of anti-empire building is rather silly. It implies that all state decisions, having been politically considered in good faith with regard to the public welfare, are in accordance with this doctrine, and that there is no false motive or political opportunism involved in the process. That, to me, does not stand with fact even in the age of the Roman Republic, which provides probably the best bar for comparison to the US. The tactical politics which resulted in alliances such as that of Saguntum in the late 3rd century, which essentially can be viewed as a declaration of war against Carthage, are glossed and obscured to square better with the "unwilling empire" thesis. Likewise are treated the US aquisitions of Hawaii, Guam, and the Philippines. Moreover, calculating purely on historical precedent, Madden is strongly in favor of continuation of the Iraq War. He argues vehemently on ikts behalf; even the idea of John McCain's "100 years in Iraq" would no doubt leave him unfazed. His primary parallel is the Roman occupation of Judaea, a particularly bloody and terrible struggle, with horrific losses to both occupiers and the occupied. Nevertheless, it is in this chapter, focusing on terrorism in the state, that Madden it is at his best. He provides an excellent, intriguing synopses of individual events over a long, disordered epoch, while weaving them together into a fascinating tale which does justice to a period of monumental historical importance. Polybius enthusiasts will enjoy; the author's voice is liberally integrated into the story. Liberals will immediately note a conspicuous conservative undertone. On the whole, it was a worthy read for its thorough examination and analysis of often poorly explained eras in Roman history. While I occasionally found myself in disagreement with certain attempts to shape events to Madden's project, I thought the conclusion was particularly insightful, a quelling tonic I would prescribe to the victims of the fear-mongering, doomsaying politics of this century. A good, easy (with substantial doses of "pop" nonfiction flavor) read for the historically interested. Otherwise, duck it for its politics and not infrequent dry spells.